The violet socks were supposed to be my project on the road. I forgot them home too... 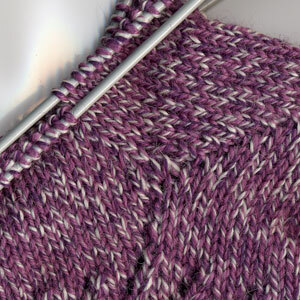 Anyway, the heel is turned on the second sock now and they should be done in no time. Here's a picture of the gussets. In these small gussets I have finally found my perfect heel. I have high instep and these fit like no other. Because I didn't want to have extra ends to sew in this time, I used the short row heel. 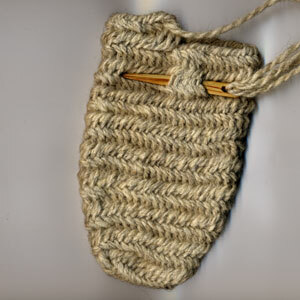 You can use afterthought or peasant heel instead, if you don't like short rows. Not to go nuts on the 500 km to Double Wars I worked on this sock instead. It is meant to be my event project, to be worked on during tourneys or wars. Nalbinding is much slower than knitting, but it is also much warmer and cushier. The needle is not in working position, I stuck it there to keep it safe. While knitting replaced nalbound socks completely by the end of 18th century in Estonia, we continued to make nalbound mittens until 20th century. Nowadays the technique is taught in schools and craft clubs again, it almost died out during Soviet time.